The Public Inquiry into the Aylesbury Compulsory Purchase Order was adjourned on Friday (until 12th May), after four days of sharp argument between Southwark Council and objectors to the order. This is the third CPO Southwark has sought in relation to the Aylesbury regeneration and we can expect many more as it seeks to get rid of leaseholders who do not accept its derisory compensation offers. 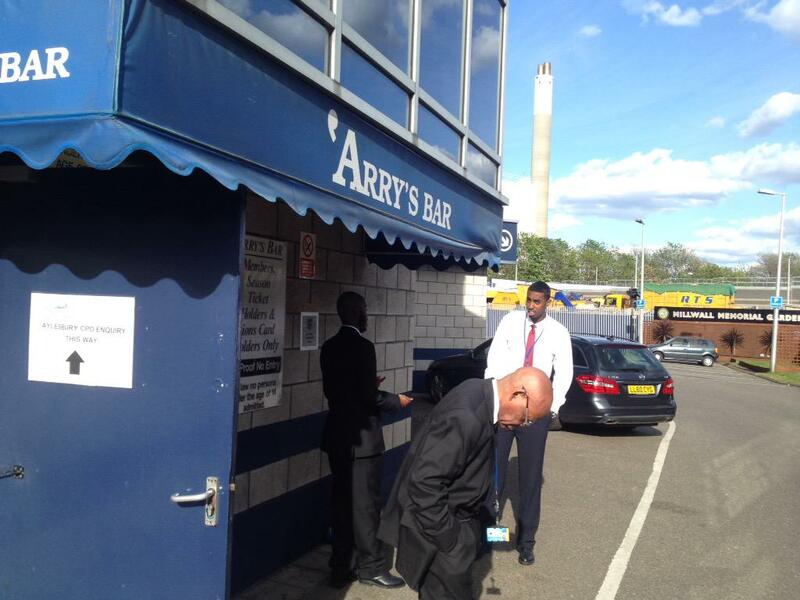 The Inquiry was conducted by government Inspector Leslie Coffey and was held in Arry’s Bar at Millwall Football ground. The Inquiry had been moved to the Den to be better able to control feared protests from angry estate residents. Southwark Council’s large team of officers were led by barrister Melissa Murphy, whose recent work includes acting for Basildon council in the eviction of the Dale Farm gypsy and traveller site. Objectors included representatives from the Aylesbury Leaseholders Action Group, the 35% Campaign and former local Tory Councillor Toby Eckersley. Over the first two days council regeneration officers detailed the background and benefits of new development with much reference to the key planning document, the Aylesbury Area Action Plan (AAAP) of 2009, according to which the regeneration will provide a ‘mixed community’ comprising about 3,500 homes of great design standards with new green spaces. Social rent or not social rent? Also present was Notting Hill Housing’s Head of Regeneration, Rosemary Houseman. Ms Houseman was closely questioned by Objectors about the funding arrangements for the scheme. Under cross examination Ms Housman reluctantly admitted that the 1670 ‘target rented’ Aylesbury homes that Notting Hill had received funding for under the Mayor’s 2015-18 MHC programme, were referred to in the funding allocation as affordable rent - not social rent. Notting Hill Housing and Southwark Council were also cross examined by objectors about the Bermondsey Spa S106 fiasco, where Notting Hill had promised social rented housing but delivered affordable rent instead. Objectors raised further concerns about tenure switching at other Notting Hill developments including Manor Place depot, where pre-planning consultation documents described “9 Social Rent Family Homes”, which subsequently disappeared into “Affordable Rent” homes when the planning application was submitted. No clear answers to these questions were forthcoming - council and Notting Hill witnesses repeatedly argued that they didn’t have the details of the schemes before them and thus couldn’t comment. Eventually an explanatory note was promised and this arrived at 2pm of what was to be the final day of the Inquiry. These points will be taken up when the Inquiry resumes next week and we will be addressing this in our next blog. Southwark Council did confirm that it had spent a staggering £46.8m on the Aylesbury regeneration scheme to date. 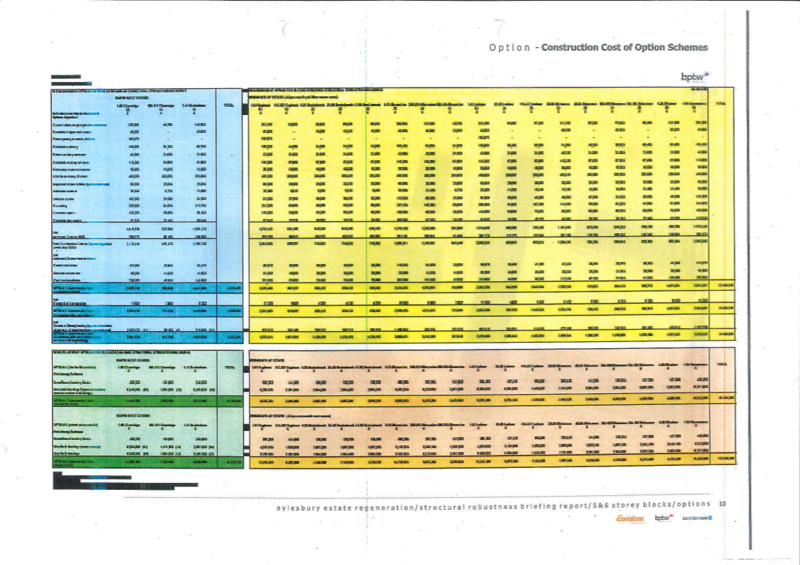 This comprised total capital account costs of £32.1m (demolition & acquisiton) and revenue account costs amounting to £14.7m (Management & Administration, Master-planning, Communications, PFI, Development Partner Procurement, Feasibility Studies etc). Southwark Council also confirmed that some of its officers valuing leaseholders’ homes were not fully qualified or RICS registered. Leaseholders had complained to RICS about officers conducting the valuations, but because neither the officers in question or Southwark Council were RICS registered, they were unable to pursue the matter. On the objectors’ side Toby Eckersley called the consultation for the AAAP a ‘sham’. He supported his claim by reference to the evidence base supporting the council’s decision making process. He took the Inquiry to paragraph 3.1.4 of the “Consultation report for the Aylesbury Area Action Plan”, which shows that Southwark received just 33 written representations in response to its consultation on the question of demolition or refurbishment, of which only 5 supported demolition while 9 supported refurbishment (the estate is home to over 7,500 people). Toby also raised several interesting legal points around whether Southwark had actually fulfilled all the procedural conditions needed to go ahead with the regeneration. He argued that several provisions of the Housing Act 1985 could be open to the interpretation that a ballot is required for a scheme to demolish an estate, especially when the scheme provides for secure tenants to be moved to a new tenancy on the site with a registered provider (i.e. stock transfer). He referred the Inquiry to the Statutory Guidance on schedule 3A and also to section 105 of the Act, which expressly mentions demolition as a housing management matter which, in principle, should be consulted on. The council responded that a ballot with YES vote wasn’t necessary because its deal with Notting Hill wasn’t a stock transfer; i.e. they were booting residents out before handing the buildings over to Notting Hill to demolish. The Inspector granted an adjournment that would allow objectors time to consider and reply to Southwark’s response. Objectors had several expert witnesses to support their case; Dr Ben Campkin of the UCL Bartlett School of Architecture argued that the unjustified negative image of the estate is the thread which underlies ideas about its demolition and regeneration. He gave a presentation based on his book ‘Remaking London’ and was subsequently subjected to a fierce cross-examination by Ms Murphy. She took Dr Campkin to task for not being familiar with the Aylesbury Area Action Plan, one of the many large documents within the Inquiry’s four-volume core bundle. Amongst other points she also referred to a previous Inspector’s ‘educated judgement’ that the Aylesbury estate was “visually unattractive”, which drew laughter from the (largely uneducated) public present . Dr Kate Crawford from the UCL Faculty for Engineering Science gave evidence ‘as an expert citizen’ on the pros and cons of demoliton vs refurbishment, for which she had authored a report by the UCL Engineering Exchange. Dr Crawford pointed out that there was no legible version of the cost benefit analysis comparing the benefits of demolition against refurbishment, which had been keenly sought by objectiors. She also pointed out that the issue of embodied energy had not been addressed. Ms Murphy had little time for any of this and again referred her to all the documents that Dr Crawford might not have read. Also appearing in support of the objectors were Professor Jane Rendell from UCL Bartlett, who in her expert witness statement pointed to seven reasons why the CPO was not in the public benefit and Professor Loretta Lees, an ‘international expert on gentrification and the policies and practices associated with it’. Professor Lees presented her research to the Inquiry which included extracts from interviews conducted on the estate and an analysis of the extent to which residents were being displaced from the area. Her displacement maps projected during the presentation, were a sobering reminder of the Heygate diaspora and provided a clear indication as to who this regeneration is (or isn’t) benefitting. On the fourth day a dose of reality was introduced into proceedings when residents gave personal testimony about the human impact and cost of the regeneration. Les Kerrigan was a leaseholder and resident of 27 years standing and he spoke up for the refurbishment option. His family and friends were all in the area and he complained of the treatment he had received from Southwark’s surveyors (a recurring theme) and their ‘derisory’ offers of compensation. Mrs Agnes Kabuto had been leaseholder for 25 years and spoke of Southwark’s broken promises, including the promise that residents could return to the rebuilt Aylesbury. Her grandchild attended the local school and her wheelchair-bound mother was becoming ill with anxiety about what would happen to them. She could not afford any of the rehousing options Notting Hill had offered her and would have a problem getting a mortgage because of her age. She said she felt like ‘a small fish in a sea of sharks’. Ms Judi Boss complained of the confusion Southwark had caused leaseholders and spoke of the support leaseholders had given each other. She said ‘I feel like I signed my human rights away when I signed my lease’. A statement was read out on behalf of Mr Mehmet Suzman, aged 80, and his wife, Mrs Suzman, aged 76, because they were only able to attend the first day of the hearing. It said that they had no idea they could be bought-out without comparable compensation. They had had shop on the Walworth Rd and had lived in the area 40 years; their family and friends lived all around them; they asked where were they to go if Southwark took their home away from them? Who would give them a mortgage? The Inquiry resumes back at the Den on 12th May.